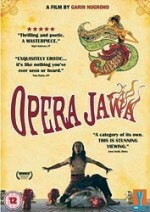 If Julie Taymor had been born in Jakarta, she might have created something like the surreal marathon of Opera Jawa. Garin Nugroho's two-hour gamelan opera of the Javanese Ramayana will be wholly opaque to many Western audiences, but not due a dearth of visual spectacle or sheer cinematic novelty. Nugroho sets the tragic love triangle of Setyo, Siti, and Ludiro (that would be Rama, Sita, and Ravana for those more familiar with the Indian epic) in a contemporary rural setting. Exhibiting an eye for hallucinatory pomp and a divine patience for the operatic art form—which I found alternately dazzling and wearying—the director adds a welcome sparkle to what might otherwise be an aimless babble of exoticism to American viewers. Aimlessness is less a problem than the sharply disjointed nature of Nugroho's storytelling; scenes dribble in without much purpose and fade away. The film is distracted, often to the point of exhaustion, with evoking tableaus and gestures rich in native semiotics, a language unfortunately lost on me. Opera Jawa has its treats, most notably a lively performance from the simian, goblin-faced Eko Supriyanto as Ludiro, but like a work from another planet, its appeal is limited.